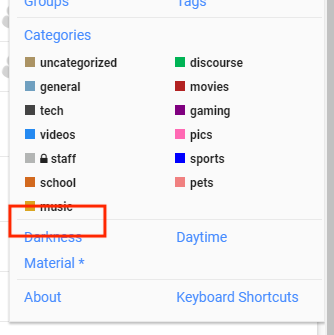 Are you on latest, are the themes user selectable? There is a checkbox saying “Theme can be selected by users”. So I assume yes. Can you confirm that you have done this? After you import the Hamburger Theme Selector you need to add the Hamburger Theme Selector as a Theme Component. The way I understand it is you’re going to need the hamburger theme selector added as a Theme Component for all of your other existing themes for it to appear. Add the hamburger theme to all of the others via the Theme includes other child themes option. this is such a useful extension. Please consider including this as a part of Discourse’ core. The theme-selector seems to be broken in v2.2.0.beta4 +266. It works ok for me - I’m using it right now on this site! Can you reproduce the problem here? If so, what browser are you using? Guys, this seems broken at the moment? At the same time there seems to have been introduced some slick new code for switching Themes on meta that avoids a page refresh. Is this because the release of this change is out of sync (for some branches) with the update to the Hamburger Theme Selector? Any idea when the change on meta will be promoted to tests-passed? Meta is running tests-passed (well tests-passed, with a little Ember 3.7 magic on top, but that shouldn’t affect this). Thanks for comfirmation. I see now this feature is already there. Yes, it is there and checked. Thanks for your interest, David, PM’d. btw, love this new feature! It looks like toggling the setting off/on has fixed the problem. There must be a caching issue somewhere, which I’ll try and track down. Is it possible to have an actual switch, built with CSS and embedded into the top bar, to switch themes from [A] to [B]? Like this. If so, what would be the command required, as it isn’t just a simple link? Perhaps it could utilize the Hamburger Theme Selector in some way? Did you already see Alien Night Theme - A free Dark Theme for Discourse ?